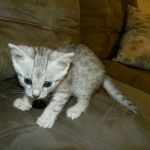 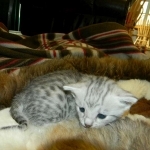 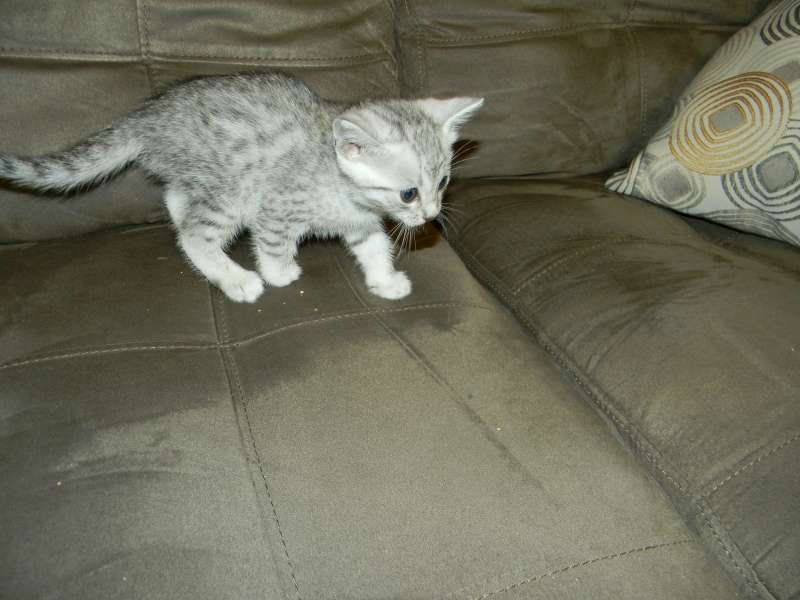 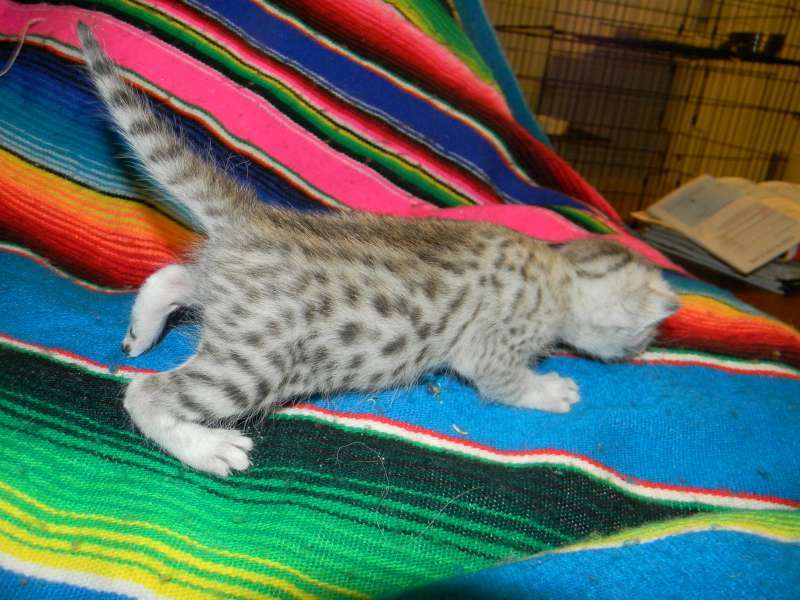 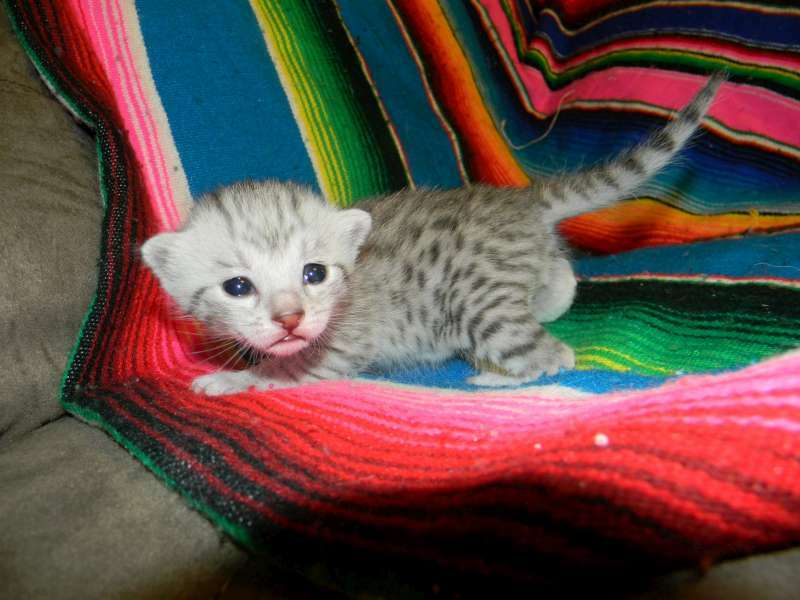 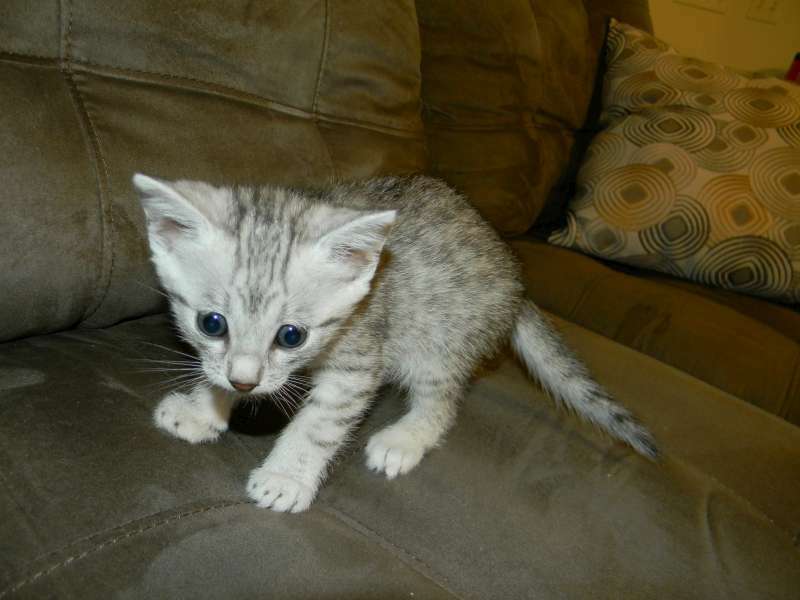 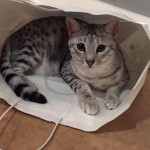 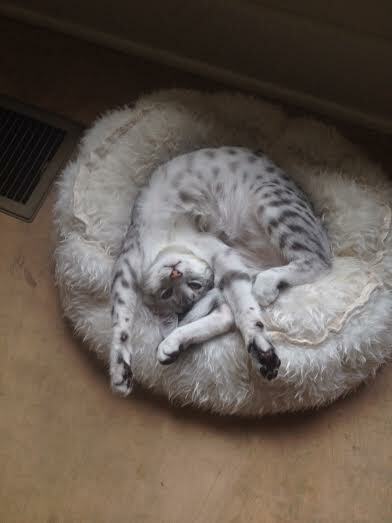 Maverick (Riki) a precious silver spotted Egyptian Mau boy is going home with Layne in NC. 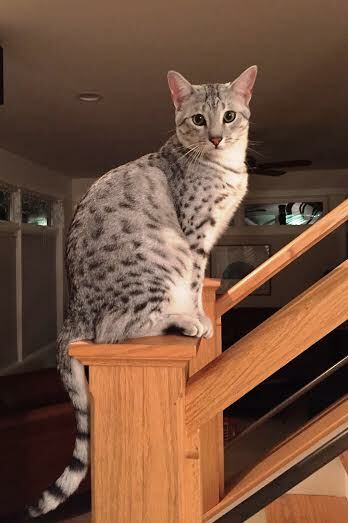 This boy has great spots. 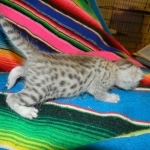 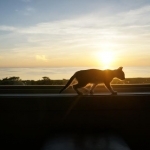 This Egyptian Mau boy will be a stunning pet. 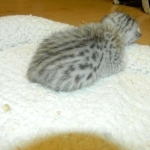 This little mau has beautiful spots. 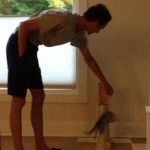 There is always something to play with when your this little. 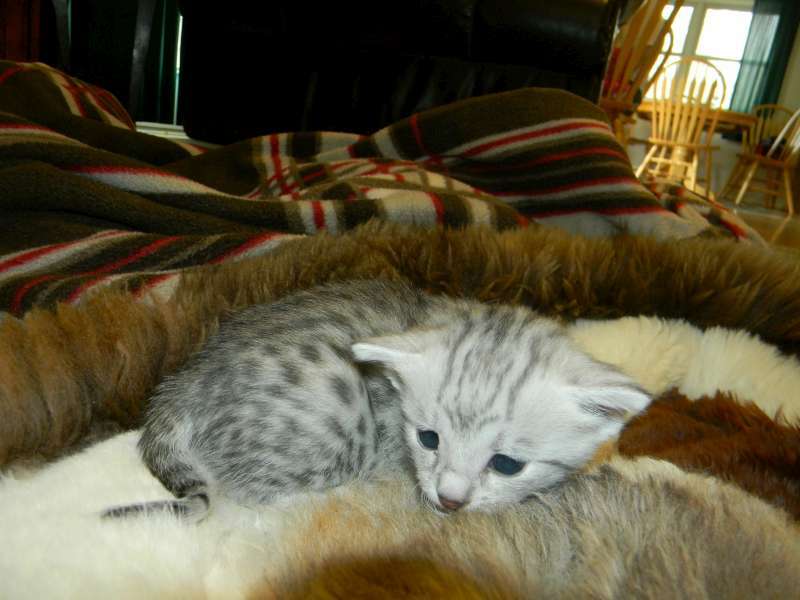 What a precious little mau face. 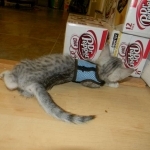 Sitting still for just a moment this silver Mau bay sports his harness on the first day of harness training. 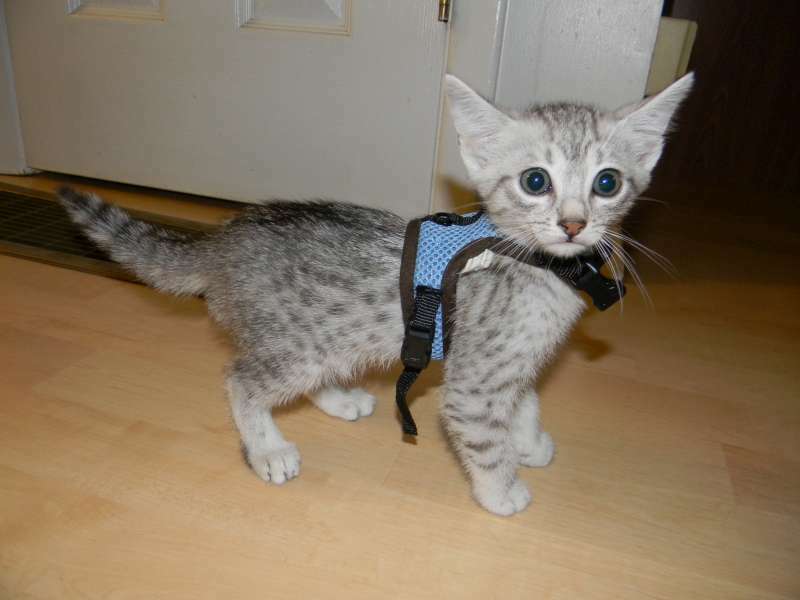 Playing in his Harness this little Mau learns to wear it without fear. 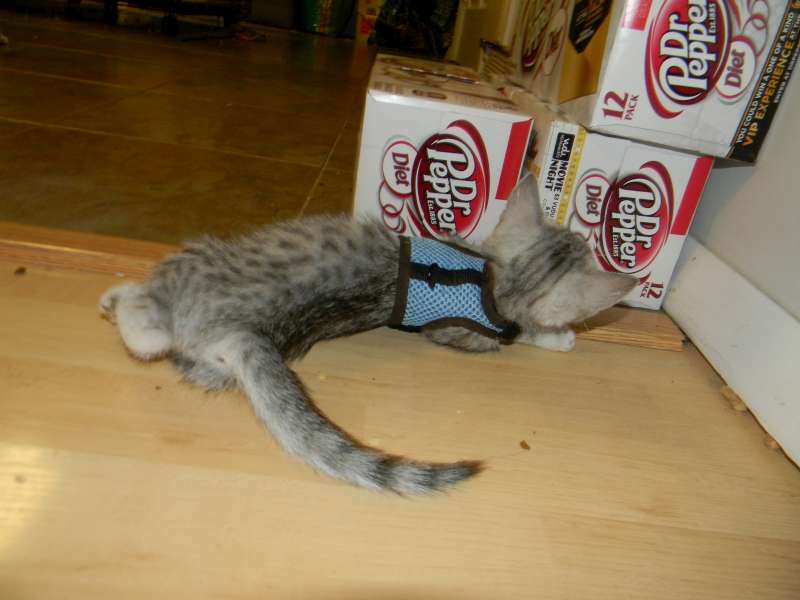 The trip went well - He cried for maybe 10 or 15 minutes then decided my finger was a toy so we played a bit with a strip of paper in his carrier then he took a nap. 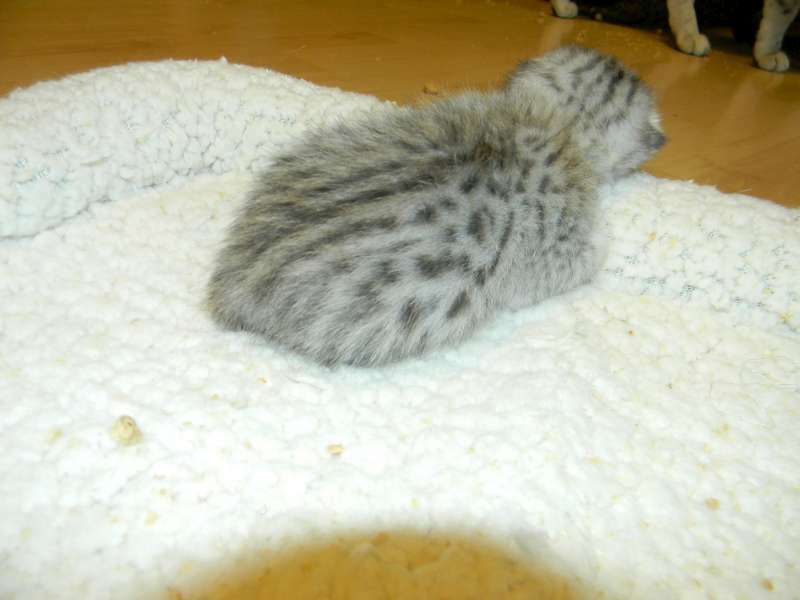 After he woke up I let him out and he was totally at ease, played on my lap with his paper strip, explored a bit (as much as he could without getting out of my reach), played some more, napped a couple of times. 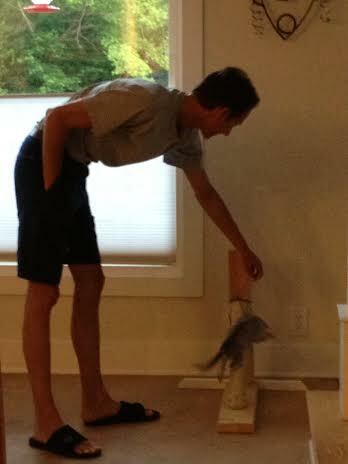 Maverick's new scratching post - still under construction but he enjoys it already! 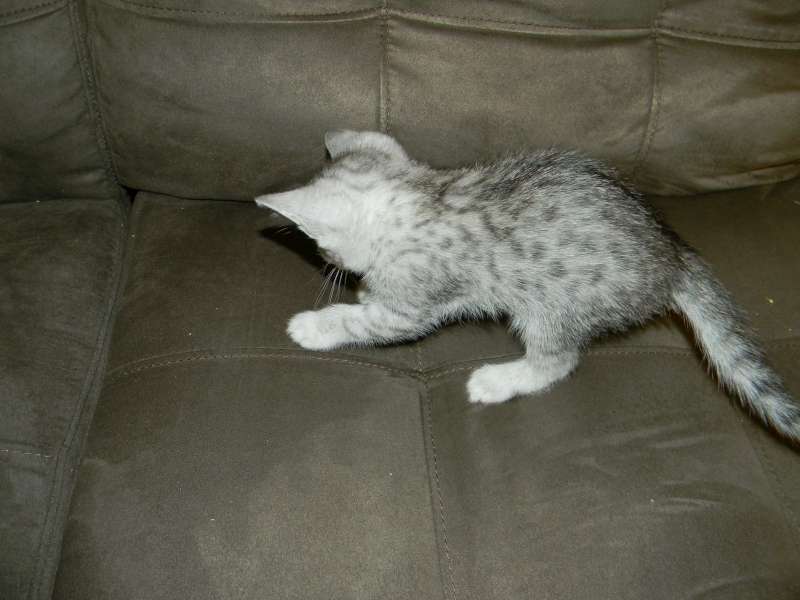 He is doing great - after a week he really hated being gated off from the rest of "his peoples" in the house so he has the run of upstairs and downstairs with supervision (except at night when is still contained in one room). 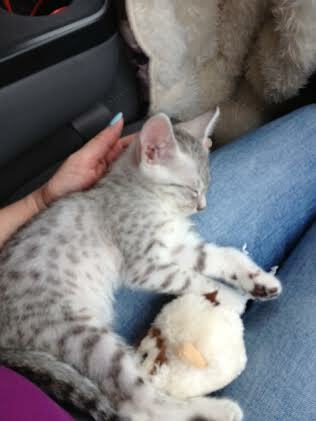 He has 2 speeds - 100mph and asleep - and is very vocal! 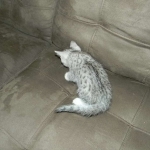 Just wanted to send a few pictures of Maverick for your website - he is nearing 1 year old! 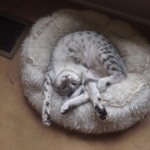 Can hardly believe it! 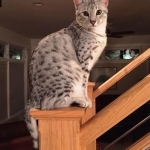 The photo of him on the stair post is February 2015. 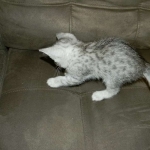 He definitely knows what he wants and can be rather persistent and stubborn to try to get his way! 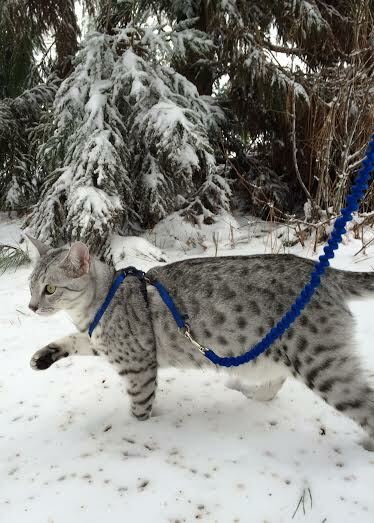 We had about 5 inches of snow last and he still went outside to explore (on his leash of course!) 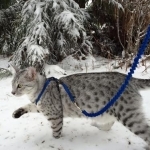 - he seemed a bit confused by the change in his environment - favorite clump of grass was a pile of white frozen stuff but he walked his territory just the same. 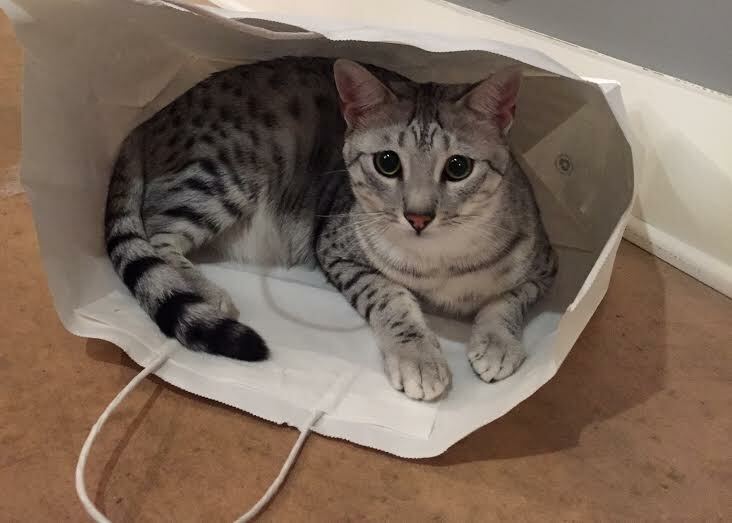 He is a gorgeous little boy - that isn't so little anymore! 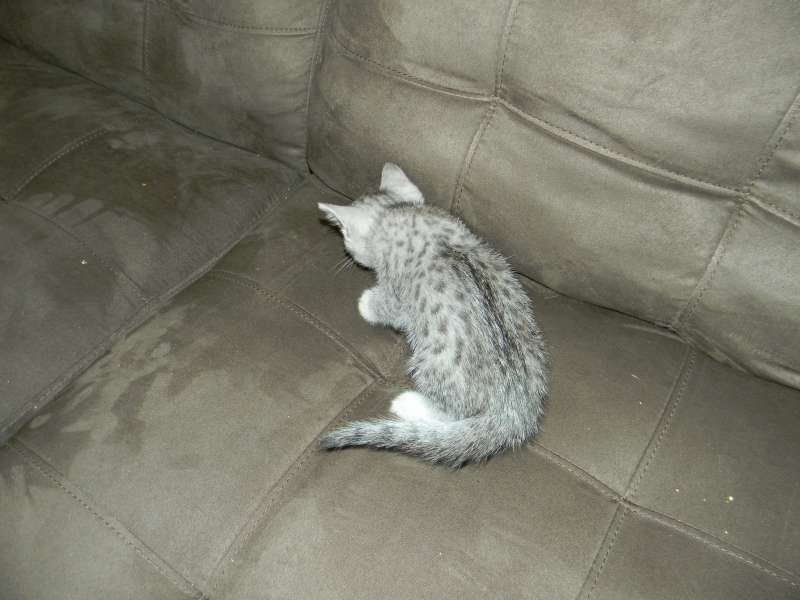 Hard to believe he was so tiny when we first got him. 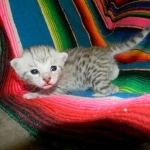 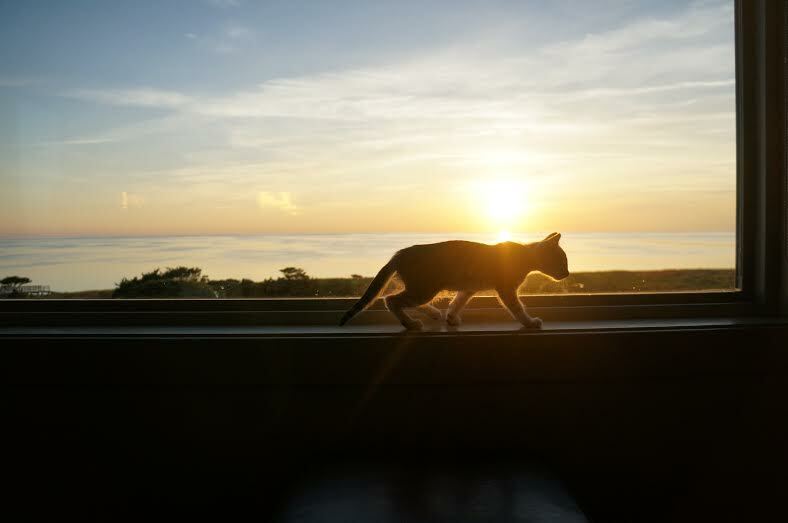 The picture of him in the window is him at about 2 weeks after we got him and the photo of him on the stair post is February 2015.